A variation on Shiva’s Flame, this is a pinky ring, or for a very small finger. It rises like a small flame from the finger. A sweet little ring. Very comfortable, beveled on the inside and flat on the sides, it’s almost as if you’re not wearing a ring at all. Cuddly ring. I love it. Perfect for a guitar player, or anyone whose fingers are in the spotlight. I tried this ring on, oh boy!! 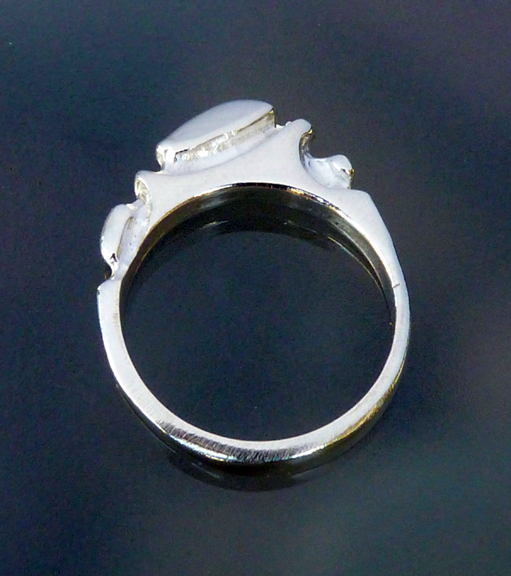 So cute – and I usually like very flat, close to the finger rings. I barely notice it’s there.